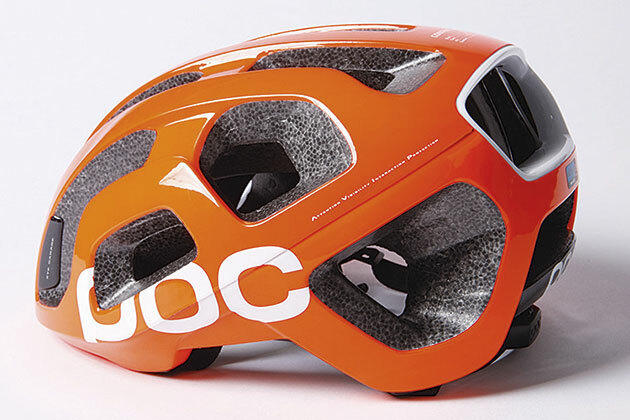 The £225 Octal is the new POC road helmet and has fewer — but significantly larger — vents, giving the helmet a more open surface, designed to keep the wearer cooler. It also has a temperature-reducing fabric padding inside the helmet called ‘Coolbest’. temples and back of the head where the expanded polystyrene liner is thicker. The ultralight adjustment system has a wheel clasp at the rear, giving a secure fit. Featuring an ICE tag on the shell for safety, the Octal also has an ‘eye garage’, to keep your sunglasses in position when they’re placed on the helmet.